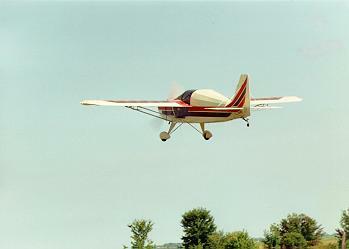 Starting in 1988, I built an airplane called a RANS S-10 Sakota. The S-10 is a two-seat midwing monoplane. It is fully aerobatic and is capable of 100 mph cruise with a top speed of about 115 mph. I flew my S-10 for almost 3 years, putting 260 hours on it, before it was destroyed in a crash after an engine failure on takeoff. A year after the crash, I bought a Pitts S-1C, which is a single-seat aerobatic biplane, and competed in one competition in it. Unfortunately, I had to sell my Pitts in November, 1996. I am optimistic that I will soon be able to resume flying, and when I do, I hope to rebuild my S-10 with a larger engine, in the neighborhood of 100 hp. In an airplane that weighs less than 500 pounds, that will be exciting! Keep an eye out for me and my S-10 at an aerobatic contest in the Northeastern U.S., hopefully on a day not too many years away.